I am thinking about swapping out a set of XTR pedals with Ultegra R8000 on my gravel bike I've been using the carbon Ultegra R8000's on my road bikes for years, and prefer them to the XTR. Just curious as to everyone's thoughts and experiences with either pedal on a gravel ride. A little info about the riding I do on my gravel bike. I would say probably 90% of riding is on gravel roads with the rest pavement. 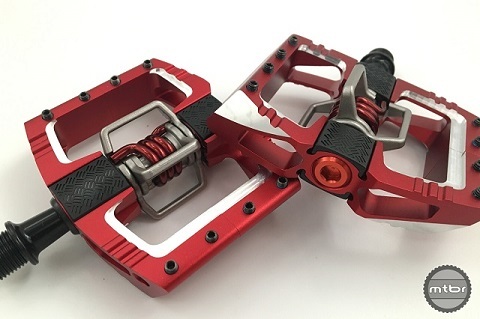 I would rather have mtb pedals/shoes on my gravel bike...I would definitely do it. I've heard gravel chews up road cleats faster, but I'm not sure if that's true. I hate road pedals and have XT or XTRs on all my bikes, even road. If I know I can complete a gravel course with very little to no walking, I'll wear road shoes and cleats every time. My foot just feels more comfortable on the wider pedal, feels like there's more power transfer, etc... At the end of the ride I'm either less fatigued or I went faster. That said, if I don't know the course or I know there will be some hike-a-bike, I'll go for the mtn shoes and pedals. For reference, I use the S-works 6 road shoes with whatever Shimano SPD-SL pedals are on that particular bike (I have a few different models), compared to Shimano XC7 mtn shoes with the M8020 stlye pedals. I really feel like the "trail" style mtn pedals with the metal support ring around the cleat makes a big difference. You have me thinking about pedal impact on speed, comfort etc. I'm always slower on my gravel bikes compared to road bikes but I've always assumed it was due to dirt roads vs. paved and overall bike weight. I'll have to try a set of road pedals with the gravel bike and see what happens. Thanks for the idea! I'm always slower on my gravel bikes compared to road bikes but I've always assumed it was due to dirt roads vs. paved and overall bike weight. It is. 😉Pedals will never make that much of a difference when you compare clipless to clipless. Comfort comes down to shoes. I don't think it makes sense to compare comfort when you use different shoes for the two different pedal systems. I'll happily pedal hours and hours with MTB shoes and tiny XT pedals without any discomfort, and I do have pretty sensitive and problematic feet. According to the internet I shouldn't be able to do that, I would need carbon soled disco slippers.